Toastmasters Speech 10 – plus things of note! At the risk of losing folks because of two thoughtf-illed posts in a row (lol)….I wanted to share my Toastmasters Speech 10 – the final in the Competent Communicators Manual! I’ve been working through this for over a year, and I finally did complete it…whew! I’d been stewing on Toastmasters Speech 10 for a long, long time…the topic changed repeatedly for months! I’m pretty happy with how this one came out, even though I had some hiccups I wish I could take back. You can watch the video below, or click HERE to watch in HD on YouTube. Class spots still open – I heard from Impress in Tukwila WA that there are still just a couple open seats left in my class tonight and I’d love it if you can make it! 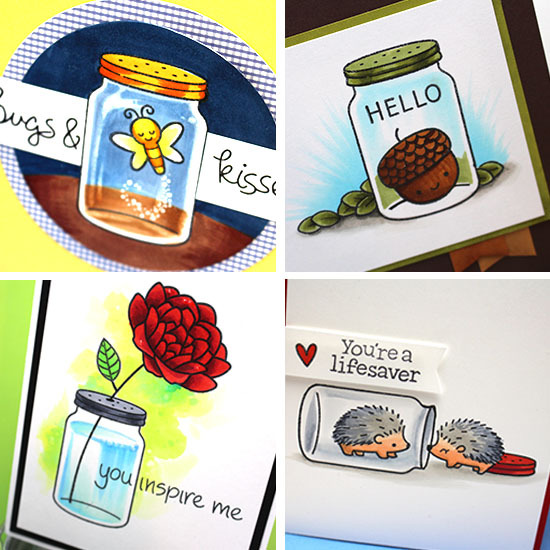 It’s “Jars of Cuteness” with Lawn Fawn stamps….sneak peek below. Class is at 6:30, and you can call the store to sign up – 206-901-9101! Call quick before they’re filled up! My next class isn’t til later in March, and I’m going to start planning my upcoming teaching tours soon too, so stay tuned for more info. West coast is next, so if you have an LSS out here that I should visit, introduce me! Milestone warning! Check out the YT subbie numbers HERE!?!? ACK!! Go share one of my videos and push me over, will ya? You know I like to celebrate by giving away stuff, right? One last thing – My friend Laura and her kiddos Charlie and Emma made the cutest cardmaking video with the Tiny Heroes set. I finally got a chance to watch it and oh my gosh it is too adorable. Check it out! Toastmaster friends with a CC: What was the title for your Toastmasters Speech 10? Just curious! That was so good….wow….the best Copics….wow……so good, loved it! Finally had a chance to watch your speech–loved it! well done, Sandy! Congrats on your speech. Huh, I didn’t know I could access your videos via YouTube that way. I clicked on the link and it took me right to a page that lists a bunch of your videos. That page has been bookmarked for easier reference. You should post that link more often! Sandy, Congrats on your Toastmasters accomplishment! Awesome speech! God is so good and so faithful! Damn girl, you coulda been a top notch preacher! Fantastic speech! Glad to see you’re a woman of Faith like me! God Bless you for starting the non profit! Sandy, your presentation was great, and the topic wonderful. I needed to hear this right now! Thank you. Awesome speech and wonderful story of how God can really impact your life if you will listen to him! Keep on girl!! You are wonderful! God is great and you are an amazing witness! Well done Sandy! I will be sharing your Toastmaster video with a friend … or two! Sandy, your speech was wonderful, I don’t think I could ever get up and speak (did declam in high school and was miserable), loved the use of the different sizes of rocks too…it really made the point! Your speech was fabulous. I am so pleased you chose to share it with us.As others have said, such good reminders (and maybe a few that were pretty important for me to hear after a stressful day at the office). On a separate note, I’m having a major squeal again over the use of the hedgehog stamp (because I own it already) and would love to know if you have any classes that are closer to the south side of the map. I live in Texas and although I live in a major city, we have no more LSS here (sad face). If you can get a little bit closer to the South part of the map I’ll sign up for whatever your class is! Great speech Sandy! Very inspiring and something we all need to be reminded of. It is too easy to stay in that talk to the hand attitude and not even realize you are there. I was in a Toastmasters club 20 years ago, and my speech 10 was called ‘the spirit of the season’. It was about not getting caught up in the commercialism of Christmas and remembering the true reason we celebrate! Not what I wanted to hear, Sandy, but definitely what I needed to hear. I know I must trust God even though life has been a nightmare lately. Thanks for reminding me! Powerful testimonial. Thanks for sharing! Loved the speech. It was truly amazing and totally inspiring! Got a few tears outta me also! I need to listen to what’s in my heart and what I really should be doing. Gezz…you need to go on the road with seminars. You’re a VERY accomplished speaker. I also agree, Laura (and her offspring) are a total hoot. I was inspired by your speech. Thanks for sharing. Awesome speech! Stepping out of the comfort zone is something I think we all need to learn more of, especially when it’s prompted by God! I for one was inspired by your speech. Thank you. Amazing and inspiring speech. I just turned 70 and shocked several people by retiring after 28 years at a job which progressively worsened. I know God has provided for me many times and will continue to do so. I wish I could give this a 2 thumbs-up. We do serve an awesome God, and your verbal testimony to this is wonderful. Have you painted/drawn a “stepping out of the boat” inspired piece as an artistic testimony? If so, I would love to see it. Inspiring speech. We’ve been questioning our lives a lot this year. Are we to move home, somewhere else or stay put? Is my husband to find new employment or stick out this job for life? Our pets are getting older. Can we just uproot them? My husband’s brother died 3 weeks a at the age of 36, so is this a sign to make changes? We haven’t gotten the answers yet but I’m sure they will come. Some of this does cause anxiety. I’m so glad that God told you to start OWH. When I found the post about the organization I immediately knew I needed to get involved. Our priest is always saying you’ve been given the time, talent and treasures, what are you using them for? I know God wants me to use mine on OWH since I feel it in my heart and spirit. Thanks for your wonderful speech. Encouragement pass it on. Thanks for posting your speech – but it didn’t feel like a “speech” – it felt like you were just telling me about something great in your life – and that’s why it’s inspiring – BIG standing O! And yes, I saw Laura Bassen’s post with her kids doing part of the voice-over – what a hoot! Among others, I follow you and Laura, and Julie Ebersole, who is also quite a hoot. But you’re the one who posts something new for me to see or try nearly every day… thank you for that. I’m a retired widow, living in a tiny town in Nebraska because “someone” told me to come here to be closer to my little grandchildren… well, maybe that was my heart, but I’m still here, miles away from any stores that sell cardmaking supplies, and I depend on folks like you to keep me charged up with ideas and new techniques, and inspiration, and buckets of enthusiasm. There are a lot of us out here who couldn’t do it without YOU! The standing O continues!!!! I am still at the “hand up” stage of my life, and here you come telling me to have faith in God. I have been thinking all along that I was trusting God and seeing him working in my life and me following along. Wow, what a wake up call. An acquaintance keeps telling me to sell my cards in a bigger way. I have sold a few to help keep me in adhesive for my ATG. Then she goes away but two days ago she was back and now here you are with your wonderful inspiration. I don’t consider myself an artist but I do make my cards with love and they do turn out pretty good. I am in the golden years of my life and have fear of financial insecurity. Gotta find me a pebble but of course it has to be the perfect pebble so it may take some time. Thanks for your wonderful message. I loved your Toastmasters speech. Thanks for being willing to share God’s amazing work in your life. You are a testimony to HIS love and power. Now to the cards: I have to know how you did the jar with the water (flower) an the hedgehog one in the jar. You can’t just leave us hanging. I’m in need! FYI: I signed up for watercolor online card class and copic coloring online card classes. However, I haven’t had time to watch more than one day of each. LOL! My “jellybeans” are used up in other areas right now, buty only for a season. Well done, Sandy! Your speech did just as it was intended and that is to inspire. The world is a better place for the work you (and God) are doing. Your step out on faith into the scary unknown continues to be a real blessing to so many. Thank you for your talent and beautiful heart and the way you share it with humor and grace.